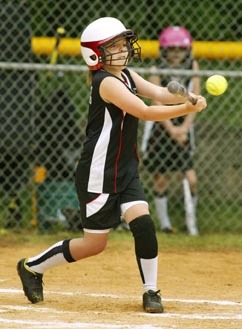 BEARING DOWN: Olivia Corrodi of the Bearcats makes contact last Saturday at Grover Field in the title game of the Princeton Girls Softball Associations (PGSA) Minors Division. Despite Corrodis efforts, the Bearcats fell 9-6 to Cardinals in the championship game. Township Committee unanimously approved an amended introduction of an ordinance at its Monday evening meeting that would establish an Arts, Education, and Transit (AET) zone in the Township. At its meeting last week, the Joint Consolidation/Shared Services Study Commission did a page-by-page review of the 19-page report they recently released, detailing and recommending the consolidation of the two Princetons. The closing of Alexander Road between Canal Pointe Boulevard and Canal Road during road reconstruction has caused problems for area businesses on the Princeton side of the project as well as for Obal Garden Market, which is on the West Windsor side. While the Princeton High softball team was fired up to make its second straight state tournament appearance, the lead-up to its first round game at Holmdel was less than ideal. The word “consort” conjures up a number of images from music history, but in many people’s minds, consorts tend to be on the small size. The north Jersey-based Tim Keyes Consort defied this definition this past weekend by bringing full forces to Richardson Auditorium for a musical New England Tapestry. Central to the concert was the world premiere of an oboe concerto also titled New England Tapestry, around which conductor Tim Keyes built a programmatic survey of 18th and 19th-century American music. That statement is a true reflection of Herman Silvermans view of life, and it has certainly characterized his own willingness to reach out to new opportunities, both in his career as an entrepreneur and in his long-time role as a patron of the arts.